Mama Nibbles: $50 Vine.com Gift Pack Giveaway! $50 Vine.com Gift Pack Giveaway! I am excited to present this wonderful giveaway hop to you all! 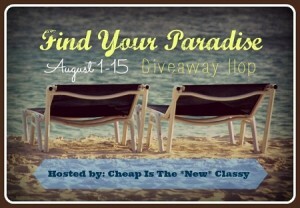 I have joined up with so many other bloggers for the "Find Your Paradise" giveaway which is hosted by Cheap Is The New Classy. We are all giving away some really fun items in this hop! I hope that you will enter my giveaway and then find the linky list at the bottom of this post to "hop" along and enter more giveaways! The more you enter the better your chances of winning right? Every blog should have the same linky list on their giveaway post for easy hopping. Have fun and I hope you win something awesome! 2 bottles (2 oz.) of Simply Organic almond extract- The BEST almond extract in my opinion. The flavor is amazing when mixed into any baked good. I used this when I need to bump my baked goods up to the next level. Cake frosting is our favorite use, it really makes a normal frosting recipe stand out from the crowd. Progressive Citrus Juicer - This handy little juicer is the cutest but it's also really convenient in the kitchen. It comes apart into 3 pieces and the bottom has a little non-skid ring to keep it from slipping. I can squeeze out 1 Tablespoon or 1 cup in this handy little kitchen gadget. I for one am in love with fresh lemon juice in my favorite tea bread. The measuring marks make it easy to juice the precise amount you will need. I was really happy about the price since it comes just under $5! I hand wash mine although it is dishwasher safe. If You Care Large Baking Cups - These 100% recycled paperboard cups are the perfect size for my muffin/cupcake pans. I love that the paper liners are FSC certified unbleached and totally chlorine free! I don't want anything scary leaching into my beautiful baked goods, these save the day. They are so environmentally friendly, perfect for those who are gluten free or vegan. On Vine.com you get 3 boxes filled with 60 cups for only around $6, such a great deal. CleanWell Sanitizer spray in orange vanilla - This is my most favorite germ killer EVER! I have been carrying one of these around in my purse at all time for probably 2 years now. I don't know how my germaphobe self ever lived without. You get SO many sprays (225+) from one bottle, it really is amazing. Usually one spray will do me and then I rub my fingers or hands together. It's really nice for the kids because it is alcohol free, totally safe and will not harm sensitive skin. A bottle of this lasts me approximately 2-3 months and it only costs around $3! CleanWell sprays also come in a fresh scent too. Core Bamboo 7 Piece Sandwich Board Set - The convenient stand is what first drew me to this set. I love anything that can fit into my short on space kitchen. I enjoy using the sturdy bamboo cutting boards to slice and dice vegetable, cheeses, fruits and more. They are really cute for serving up appetizers or for serving different cheeses with a wine tasting party. The boards each measure 5.9" x 12.6". The best part for me is cleanup because these bamboo boards wash up so easily in the sink. These are made of sustainable materials and that is rick-rollin' awesome!